Every time the cash register rings, an angel loses its wings. My hometown, Altoona, Pennsylvania has apparently sold its soul to the devil. What’s the going price for a city of about 50,000 residents? About $25,000. Fruit Juice or City . . . YOU decide! According to Business Week, the City of Altoona has officially changed its name to POM Wonderful: The Greatest Movie Ever Sold in exchange for $25,000 for the next 60 days. How in the hell am I going to fit that on an envelope? I just don’t see it catching on. Does everything associated with Altoona have to change its name? Is the hospital now The POM Wonderful Regional Health System? The POM Wonderful Area School District? Are babies born in the next sixty days going to have POM Wonderful listed as their city of birth? Do I still need to pay Altoona City Taxes for the next sixty days, or do I have to send the check to POM Wonderful? According to the article, only five people were protesting. I guess we’re all numb to crap like this or we just don’t care. And after all, surely the police department will find a way to waste use this cash windfall to make things safer for me. The purpose of the documentary is to start a national conversation about the naming trend. I’ve already noticed this in the arena of sports, from the naming of ball parks down to the naming of a power play in hockey. You have the Lexus Half-time show and College Gameday brought to you by the Home Depot. Will baseball follow the trend with the seventh inning stretch brought to you by Preparation H? Or the Tough-actin’ Tinactin ball scratch? Where will it all end? The Rapture, brought to you by Verizon. The AT & T Armageddon. The New York Times End of Times. Call it what you want: sign of the times, basic greed, an advertising gimmick, or just plain old-fashioned stupidity. 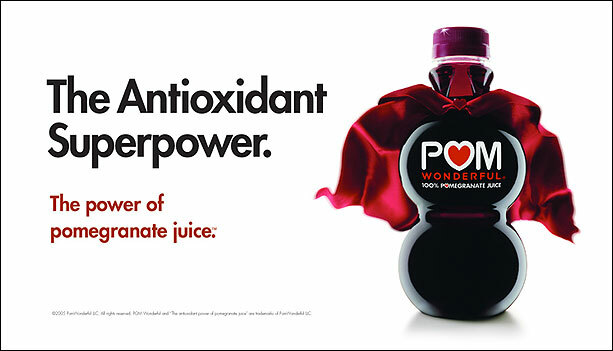 Just don’t call me POM Wonderful. Then again, scratch that. I’d temporarily change my name in a heartbeat for $25,000. People have called me worse names than that for free! My (garage) door is broken. Yeah, I could have made that the title, but I like kaput better than broke. Broke makes it sound like my door over invested in Enron and Dotcom stocks. I wish I had listened to my door. My portfolio ist kaput as well. It worked fine last night. This morning, I pressed the button and nothing happened. I pressed the button again. Nothing still. I pressed it harder thinking that might work. It makes the elevator come faster doesn’t it? So I turn on the garage light and head out to check things out, as if I might actually be able to fix what is wrong with the garage door opener. I try using the remote in the car on the outside chance that the button I just pounded into the wall ist kaput. The remote fails me. The garage light is on and I doubt there is a separate breaker for the lights, and the unit is still plugged into an outlet without a fuse so it appears that the problem is not Scotty–we have enough power but we can’t raise the forward shields. And I can’t get my car out of the garage. I look up at the unit as if I could figure out what might be wrong. But there is no obvious abnormality. Other than some dust and dirt, it looks just like new. I sigh and disengage the door and open it manually. All I know at this point is that this is probably going to run into some money. These things always do. They never say there is a wire loose and they fixed it. That’ll be $10. No. I will not hear that. I will consider myself lucky if I don’t have to replace the whole unit. With my luck, I’ll probably need a whole new door. And a new garage. And while we’re at it . . .
That’s how we fix things these days. 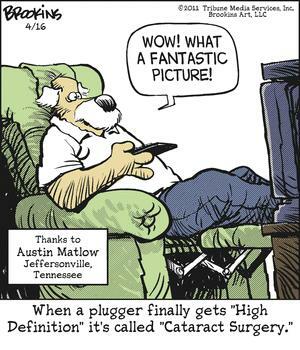 It doesn’t matter if it is a transistor radio, a home computer or a HDTV. I have at least two VCRs that are in various stages of disrepair. It truly would cost more to fix them, or at least that was what I was told. I don’t think they know how to fix them, so they tell you that just to get you to buy a new one. I’m not going to pay someone that much money to fix it, but I keep pretending that someday I will figure out how to do that myself. Of course, by that time I will be senile and won’t need them and they won’t be producing VCR tapes anymore. Do they even make them now anymore? But I digress. It’s always cheaper just to buy a new one. You’d think that someone who knew how to actually fix something could become very popular. But he or she would actually have to work, and in the end, it would probably be cheaper and faster just to buy a new one. It’s really kind of sad when you think about it. All that electronic equipment just wasted because no one can repair it cheaper than it is to reproduce it. I could just continue to put the door up and down manually. Yeah, that’ll happen . . . right after I get it fixed for ten bucks. The Internet is a wonderful place to learn about new things and connect with people from around the world. There is a wealth of information and data literally at our fingertips. The end result is that never before in the history of mankind have we been able to do so little with so much or to waste time so efficiently. Given the choice of research that will make my life better or playing a game . . . I play a game. It all started with PONG back in the seventies. Then it was Asteroids, Space Invaders and PAC Man. Frogger. Tetris OMG! I remember going to bed at night and closing my eyes and I could still see those pieces falling. Then along came personal computers which opened a whole new world of games. My old MAC-plus had a game called loderunner with a little stick figure guy that you had to work through a series of like 100 different maze levels. I think I spent more than eight hours one day trying to get through those levels! I can’t imagine playing a game of solitaire–with an actual deck of cards! I love Hearts, but have not played that game with actual cards–and actual people–since high school. Game consoles brought games like Super Mario Brothers. I won’t even begin to ennumerate the vast numbers of games available today. You can even play games on your phone–the latest craze is the Angry Birds. I have not yet succumbed to this heinous addiction, mainly because my cell phone is pretty much just a phone. I am so 2000-late. I can conceivably text, but I have to use the numeric keypad and quite frankly, it’s easier just to CALL someone than to vex myself trying to text. But I am not without my obsession. 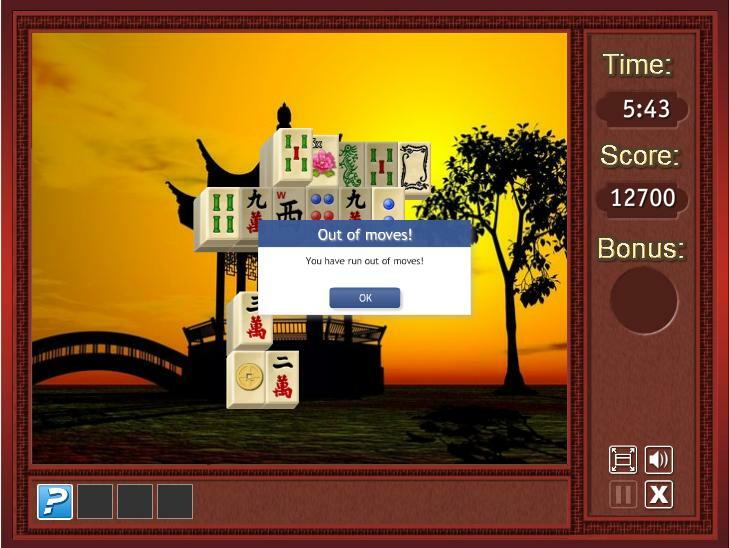 Lately, I have been playing Temple of Mahjong II on Facebook. I was already familiar with the game MahJong Titans that came with the games package on my PC. Titans had several layouts to choose from and the game is actually challenging. The Facebook version was different, though. It offered a much wider variety of layouts and themes. You earned points as you completed games. You could win new layouts and win tiles to open new themes. As you won more games, you moved on to higher levels. Sometimes they offered extra point days where your point values would be multiplied by 5 or 10. That meant you could move ahead even faster toward the next level. The game also allowed a series of “cheats” which are perfectly legal. You could get a hint (I rarely ever used or needed this one), reshuffle the tiles two times (so when you got to a point where there were no matches, you click and it changed the tiles without starting a whole new game), and you could pocket a tile for use later. The game also had bonus tiles for 2x, 3x, 4x and 5x the score. Simply making a match earned you 100 points. With the multipliers you could get even more points. There was a timer, and the faster you completed the layout, the more bonus points you could earn at the end. I think the cheats were like lifelines on Who Wants To Be A Millionaire, which endeared them to me all the more. Using these other options, I almost never was unable to completely clear the board of tiles. There are some of the MahJong Titans layouts that I can only clear 20% of the time because they are more difficult and there are no reshuffling features. 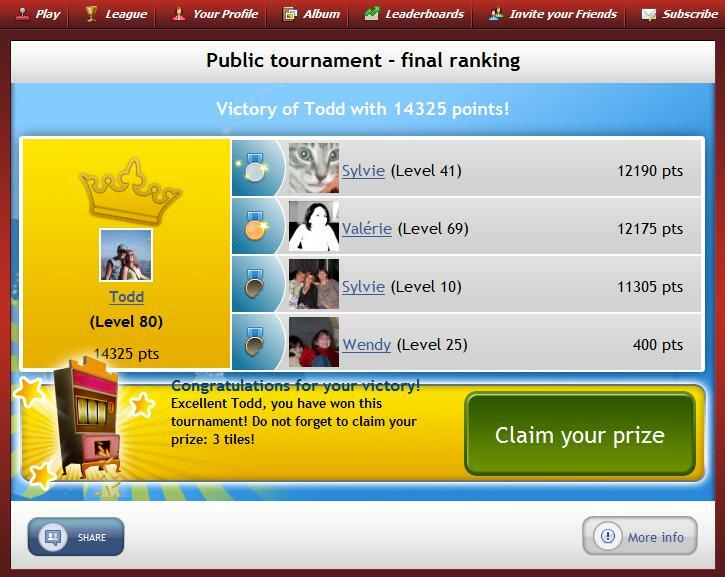 Facebook also allows you to compete in tournaments against other players–from around the world. I don’t know why, but there are a lot of people in France that play Mahjong. Sacré bleu! In these tournaments, you play against 4 other players–you don’t get to choose. All five participants play the same layout. High score wins (either Level points or free tiles). I was able to win more than 90% of the time. My passion for this game got me to the highest level, Level 80 or Fakir Monk. My total score is 95,362,745. I have played 4,630 games. Most games take me around 3-4 minutes (the timer gives you ten.) At 4 minutes per game, thats over 308 hours of playing time! But then the powers that be decided to make changes. Most human beings avoid change by nature. Progress obviously has it’s growing pains, but without progress, we’d still be scratching flint together to make fires in our caves. You would not be reading this without it, and I would never have become addicted to this on-line game. In retrospect, living in a cave might have been preferrable to playing Mahjong. Apparently, the original version of the game had some problems with it. Occasionally, when you were playing a tournament, the score at the end would not be sent and after the timer expired you were given a zero. This would be particularly frustrating if the score you had in the game would actually have won the tournament had it not been lost somewhere in cyberspace. This happened to me often enough to make me angry, but not enough that I’m thrilled with the changes they made. When they attempted to fix the game, they addressed another issue: some computers ran the game at different speeds. I had noted that but never was sure why. Playing on my wife’s laptop was the best. (Not sitting in her lap but using her computer.) The whole game ran slower and you had time during the bonus periods to clear more tiles and earn more points. The desktop PC at home was the fastest and the one in my office at work was intermediate. So now, the game supposedly runs at the same speed on all computers. As far as I can tell, this is true on the computers that I use. Unfortunately, this new speed is faster than I was used to. Prior to the change, I could routinely score above 20,000 (my average if you do the math above was 20,600.) My high score is 36,650. Now I am lucky to break 15,000 and it takes a maximum effort to achieve that. I don’t think I’ve scored over 24,000 since the change. I’m working harder for less–it’s as bad as Medicare! Score is worse; same result. But these changes appear to hit everyone fairly equally, as I am still able to win most tournaments. But there are other changes that are more subtle. In the old game, if you matched a 4x mulitplier with a 5x mulitplier, you would get 4x the points (400 per match) until the bonus timer expired. If you then clicked the 2x and the 3x multipliers before the first bonus timer expired, it reset the bonus time–but still at the 4x level. In essence you get twice the number of 400 matches. If you then reshuffle, the computer would restore all the mulitpliers back on the board somewhere so you could reuse them again. If you matched up both 5x or both 4x, then you wouldn’t get them back. As long as you used only one of each, you’d get the full set back. This enables you to get much higher scores. Now, the reshuffle doesn’t guarantee you that you will get them back. You might. You might not. In fact, it seems might not happens more often. Cant clear the board like I used to! It also seemed like the old reshuffle gave you a better chance to clear. When the tiles were reshuffled, it seemed like the layout was set up well to clear all the tiles. In other words, one tile did not sit on top of its match to block it. Thus, you were almost always assured of clearing all the tiles. Since the change, it is more common for me not to be able to clear the tiles. In fact, sometimes you come down to two remaining tiles and they do not match. There is no way to actually clear the board. Skill has nothing to do with it. What was once a fun game has now become painful to play. Imagine if the timer were changed on PACman so that you couldn’t kill the ghosts for the same length of time. Or if Mario lost his superpowers faster. Or if in Tetris, when the shapes start falling faster, they fall even faster than you expect for a given level, and sometimes they drop new shapes that don’t even fit with the old ones. That is how I feel. And yet I still want to play. I still want my fix. But each time I log back in, I become more frustrated. I am becoming an angry bird. It all started back in 2002 when my daughter decided she wanted a puppy. We don’t need a dog. I did not want a dog. It’s not that I am not an animal lover. I love cows. In the form of hamburgers and steaks. I like chickens a lot–they taste like chicken. I adore lobsters. In melted butter. What’s not to love about animals? Okay, I’m not big on ham–I will not eat it Sam I am–but I do love bacon. Mmmmm bacon. I’m making me hungry here. A few years before she asked for a puppy, I was trying to get on the show, Who Wants to be a Millionaire?–the Regis Philbin version where the general public could answer questions on the phone or take tests to get auditions. One of the questions the producers supposedly asked was, ‘would you kill a mouse (or hamster or some other small varmint) for a million dollars?” I’d kill a mouse for a Klondike Bar. For a million dollars, I’d eat the varmint. I already pay fast food places to eat whatever they call beef, so getting paid (a lot) to eat a mouse sounds like a great deal. But I digress. I really don’t hate animals. I just don’t want them chewing my shoes, digging holes in my yard, shedding hair in my house, and pooping all over the place. A puppy is a lot of work (and I am by nature lazy), and I do not want a puppy. So when my daughter looked at me with those big brown (puppy dog) eyes, I said no to the puppy. I put my foot down firmly. And do you know what I got? Puppy poop on my shoe. Well this past winter we had to put Carly down as she had an inoperable stomach tumor. She was arthritic and blind despite only being about 9 years old. It was a sad day–even I was moved to tears. But out of my misery, was one bright shining thought: our house was now dog free again. No fur on the floor. No poop in the yard that I had to dodge while mowing. We had already replaced the white carpets with hardwood and a new set of livingroom furniture since Carly all but shredded the original furniture as a puppy. Read my lips: no more dog. That lasted about a two months. And now we have TWO puppies. Not just one but two. That’s twice the poop if you do the math. When did I lose control of my house? I strongly suspect it was when I said ‘I do’ but I really wonder if I ever had any control. Perhaps it was all just a figment of my imagination. Kurt is a german shepherd mix. His litter was abandoned. There were 7 puppies, two males and five females, so they were each named for one of the Von Trapp children. We ended up with Kurt, and Fraulein Helga was correct: he is incorrigible. Brittany chose Carly. 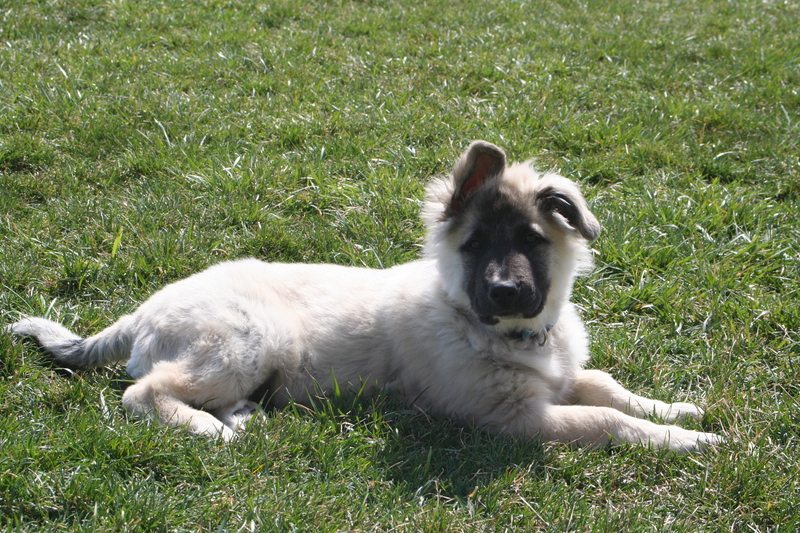 Brandon, my eldest son and second child, got to pick Kurt–he is partial to German Shepherds. 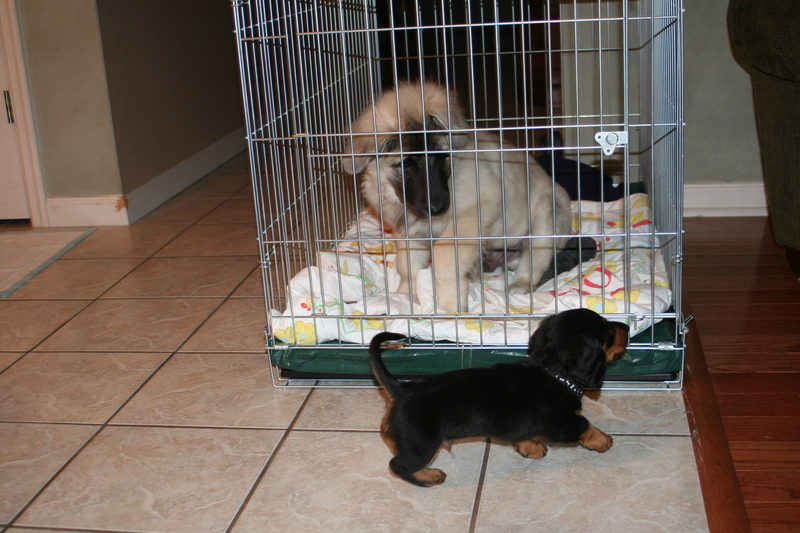 Poor Cameron, my youngest, who favors dachsunds, would have to wait his turn. That wait turned out to be about six weeks. 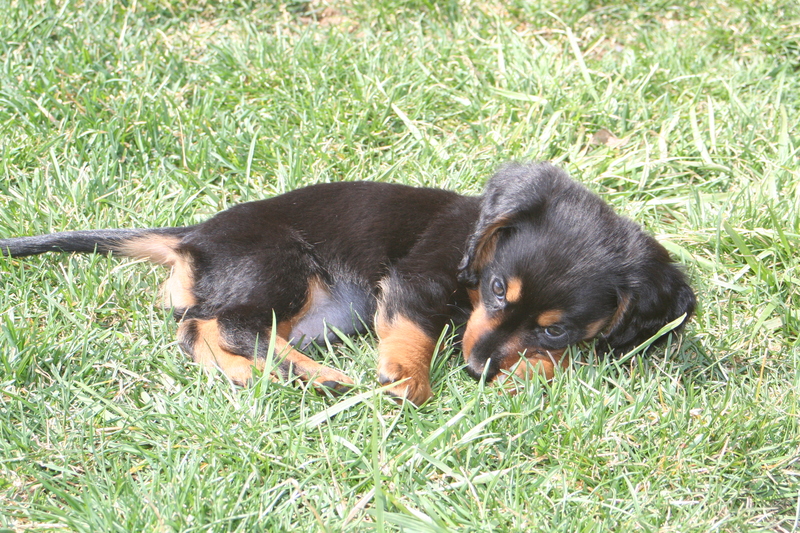 Now we have a miniature dachsund named Sammy. He is basically another chew toy for Kurt who has already quadrupled in size since we got him. Aren't they soooo cute together? 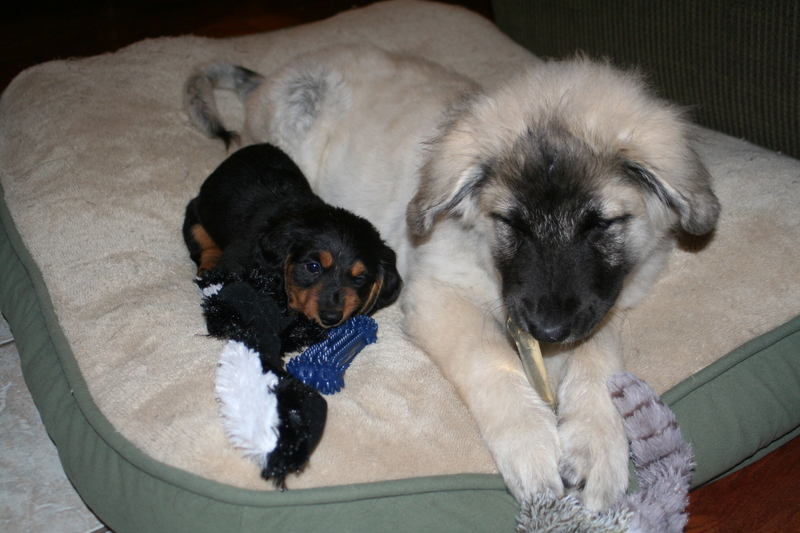 They play well together–for about five minutes. They are as bad–if not worse–than my kids. 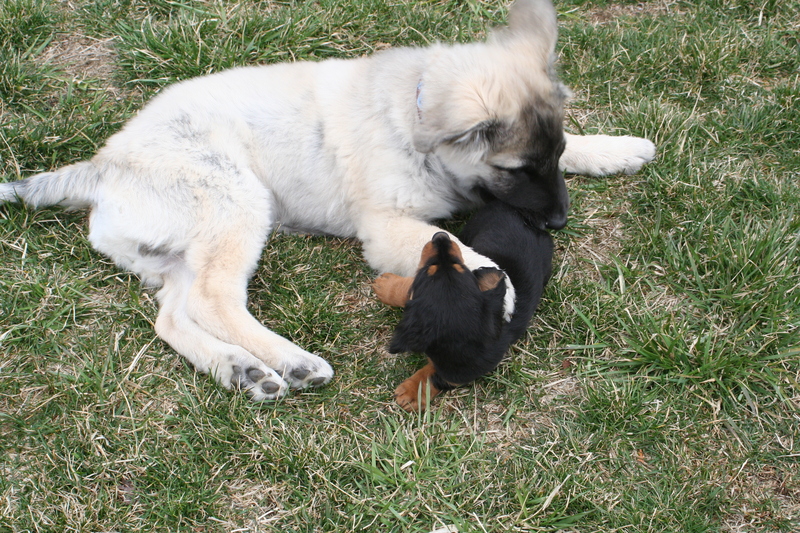 And the little one attacks the big one like he is some kind of super dog. He is only a mouthful away from extinction but thinks he can win this battle. He does have the advantage of being low to the ground and at just the right height to bite Kurt’s . . .well, it’s not his tail and let’s leave it at that. Unfortunately, Kurt being the older sibling, has to have a time out. But that doesn’t keep the other one from taunting him! Ha Ha! You can't get me! These dogs may be the death of me. I just hope I don’t have to buy new furniture again. I originally published the amusing story about getting Carly–Puppy Love–on an old geocities site that no longer exists. If anyone is interested, leave me a comment and I can repost it here. How do you even categorize news like this? A sign of the apocolypse? Stupid Human Tricks? In case this tantalizing tidbit of technological transcendence has eluded your perusal, I am talking about the announcement that scientists have genetically modified COWS to produce HUMAN MILK, as you can read about in this article by Richard Gray, Science Correspondent. The milk tastes stronger than normal milk. Seriously, they have created around 300 of these animals to produce human breast milk. Isn’t science wonderful? Always pushing the envelope, breaking down barriers, answering unanswerable questions. They hope genetically modified dairy products from herds of similar cows could be sold in supermarkets. Well there’s the answer: MONEY. But just who is the target consumer? Babies? Most don’t have disposable income; just disposable diapers. What kind of mother is going to buy this, this, this . . . . MILK, and feed it to her baby? What baby is going to choose to feed itself this way? That makes me feel better. With quality like that we can expect the milk to be high in formaldehyde, arsenic, and lead and as well. There are horror movies with weaker plots than this. I am going to assume that this is a big problem for cows, probably right up there with mad cow disease. Angry Udder Discharge. Offspring of cloned animals often suffer health and welfare problems, so this would be a grave concern. Health and welfare problems? Loss of insurance? Will these cows have to find jobs instead of getting their monthly checks? Regardless of the ethical issues, I think it is quite clear that these genes still make the cows look fat. My day got off to a bad start when I checked my email this morning. My credit card company had sent me a notification that a large purchase had been applied to my account. Fortunately, I had instructed them to do so for purchases over $300. Unfortunately, I did not recognize the company. I called my wife, and likewise she had no idea what the charge could be. But there it was: $541.44. So I went to the website that was associated with the charge. They sold toys. I have children, but my youngest is now 12. I didn’t see anything on the site that would interest them. So I called the 800-number and questioned the purchase. Apparently, I wanted over $500 worth of . . . wait for it . . . legos and I had moved from Pennsylvania to Tennessee. This little treasure trove of plastic building blocks had been ordered on-line and an email address with my name in it had been used. It was not my email. They had my home address, but the items were to be shipped to some place in Tennessee. The lady on the phone was very nice and I think I caught the issue before the order was actually shipped, as she said they would stop the order. I still had to call my credit card company and naturally they are going to close the account and issue me new cards. There was also a charge on the same day for Itunes for $1.00 and for Yahoo Mail for $19.00. I do not use Yahooo mail, but my wife has a free yahoo address. I did just make a couple of purchases from Itunes, and I thought it interesting that they requested my credit card number again–and didn’t download the song I requested. I clicked to download it again, and the second time it worked without requesting my card number. I’m pretty sure that is when the security breach occurred. But how they infiltrated iTunes I do not know? I am sure of it now that I googled “iTunes credit card fraud.” Among the top links was a messageboard with posters lamenting security issues with their iTunes account. Another story described the $1.00 “test” charge like the one applied to my account. I actually purchased more than $1.00 worth of tunes and that purchase hasn’t been applied to my account yet. Now it won’t thanks to this theft and the company closing that account number. But there is a much more significant issue here. What is wrong with criminals these days? $541 worth of . . . 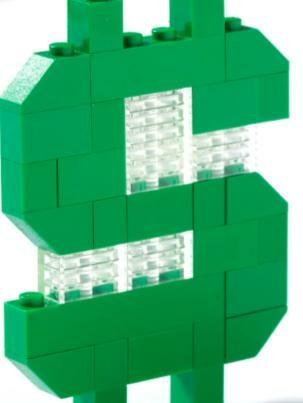 LEGOS???? Seriously? Did they buy the Death Star? You go to all that trouble to steal someone’s credit info and you buy . . . plastic bricks? I’m offended. Isn’t my card good enough for an HDTV? Or a 3-D TV? Have I been scammed by a six year old??? Good God, if you’re going to risk going to jail, why not buy some jewelry. Apparently our edumacational sistem has faled these yuths.